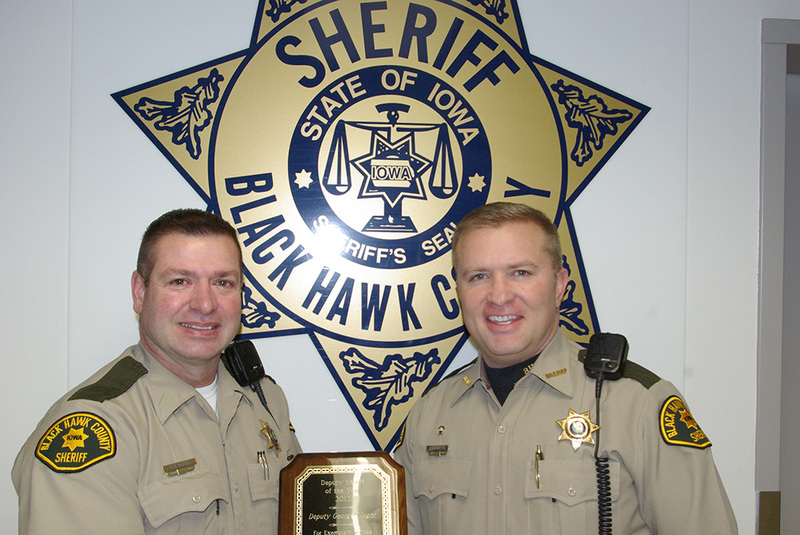 In a brief ceremony during the Black Hawk County Law Enforcement Association’s Christmas party, Sheriff Tony Thompson announced that Deputy George Wright has been awarded the 2012 Deputy of the Year Award. Deputy Wright was cited for his commitment, years of diligent service, and dedication to the agency. Deputy Wright is assigned to the jail division where he is a senior deputy on 1st shift. In addition to being nominated by the administrative staff for this honor, Sheriff Thompson also initiated a peer recommendation this year, and Deputy Wright was overwhelmingly recommended by his peers in the jail division for the recognition as well. “Deputy Wright has distinguished himself through his positive attitude… always upbeat and energetic. He has been able to take his 20 years of experience and leverage it into sound decision making and clear advice and counsel to his subordinate peers.” says Sheriff Tony Thompson. Deputy Wright started as a Deputy Sheriff with the Black Hawk County Sheriff’s Office on February 3, 1992.